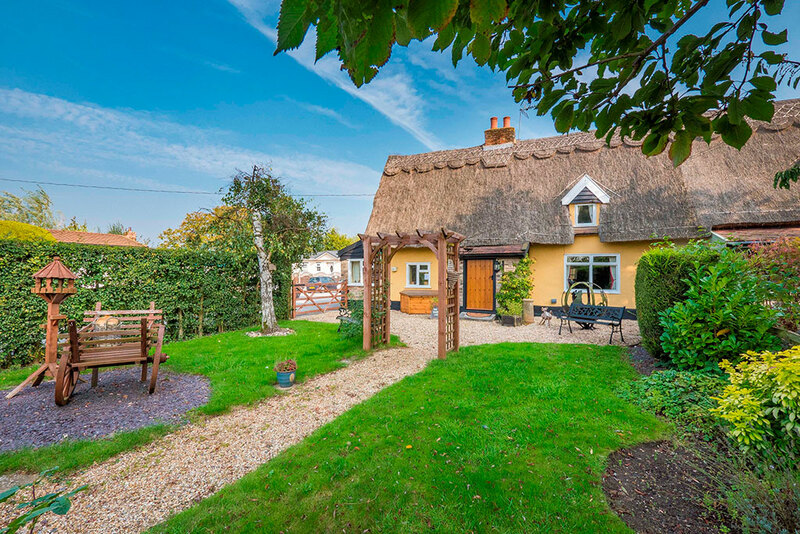 This delightful end of terrace thatched cottage was recently featured in Country & Townhouse amongst their feature 10 of the Most Romantic Country Properties Around. It's not hard to see why! This spectacular Grade II listed building was recently offered for sale by Hunters at £299,000. Although it's a cottage it's hardly lacking in features as it comprises 2 bedrooms, 1 bathroom, 3 reception rooms, study area, off street parking (for multiple vehicles) and front and read gardens. Set away from the road this wonderful cottage is a short walk into the nearby village of Hitcham. With its charming period features and spacious interiors this would make a wonderful summer home or retirement property away from the hustle and bustle of major cities - though Ipswich is conveniently accessible by car in 30-40 mins at times of low traffic. In and around Hitcham there are museums, bars, churches, farm shops and of course miles and miles of beautiful countryside. The Dedham Vale Area of Oustanding Natural Beauty is roughly a 30 minute drive away. Various coastal destinations are also reasonably near if you don't mind driving 1 to 2 hours. For more information on local things to do in and around Hitcham take a look at this Trip Advisor page - the Lavenham Falconry is amongst the highest rated attractions in the area, one could make a day of it and visit Little Hall Lavenham, Lavenham Guildhall and The Church of St Peter & St Paul too!